When the lovely Karen and I decided to start our Me Time section on our blogs we did with a little adventure in mind, but wow I didn’t realise just how much fun we would have on our first Me Time adventure. Amidst a week of torrential rain and wind, I must say I was feeling a little worried about the weather. But nature was kind and gave us a nice warm sunny day. I arrived and met with my lovely climbing partners for the day Ally, Tanya, Laura and my buddy Karen. We all chatted over coffee, to be honest I was so relaxed that I never gave the climbing a second thought. But during the pre climb training it struck me that this was not like any climbing experience I have ever done before. This was another level; the safety was totally in my hands. No one else’s just mine. Now here lies a problem, you see I am a kinesthetic learner. I learn by doing, I can’t take in information by watching a listening it just doesn’t go in, I can’t focus. So the information sheet was no use either, I kept trying to read it but couldn’t take it in; I started to panic a little. This isn’t how I learn, I learn by doing but couldn’t afford to make a mistake up a tree, and trust me those trees were high. 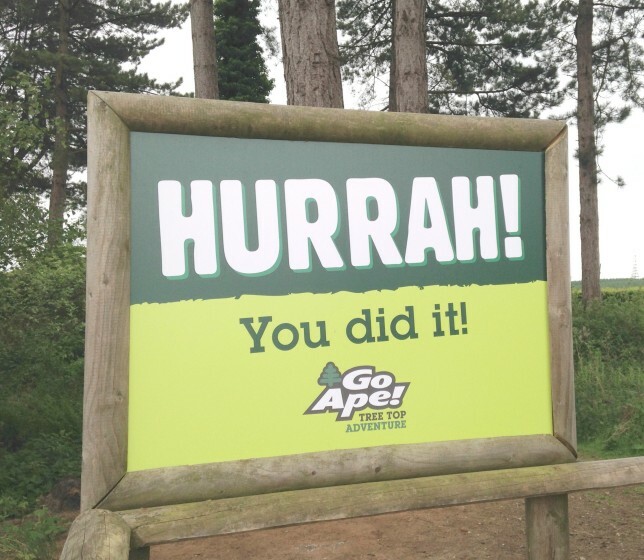 But Go Ape totally had it covered, they clearly have a strategy to cover all learning styles, which in my eyes is total genius, they had a smaller practice track, and thank goodness they did as I got it wrong for the first few connections. You see you need to work through a sequence of connections every time you arrive at and leave a tree. You must get these connections correct, failure to do this would mean you could temporarily be unattached from the course all that way up in the trees. At first I was nervous, not of the heights but getting it all right, going through the course safely. What made me feel at ease was the girls, they were all so supportive and between us we supported each other and laughed so much. Once I had relaxed I absolutely loved it, that feeling of being so high, totally in control. The stunning views, and sensational zip wires were so amazing. Climbing through the trees in such incredible surroundings made you feel at one with nature. It was so exhilarating, exciting and yet very calming. This is the perfect activity to challenge yourself, but also a great family activity that I cant wait to take Chris and the boys to experience, although I do think one of us will stay glued to Joe at all times, he does think he is a mini Bear Grylls, so may be a little over-confident. 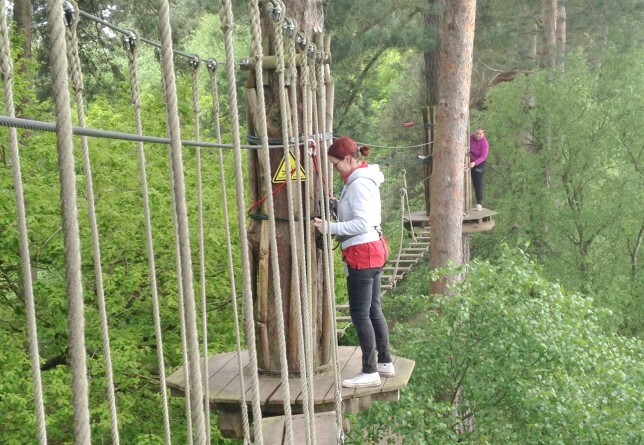 Although we were gifted the Tree Top Adventure all the opinions are my own.